Interesting how anthropology sees cooperation as the “starting point for every known human community”, while the three mechanisms for the evolution of cooperation all view cooperation only as a response to competition. These theories of evolution focus on cooperation and competition as opposites, you can have one or the other. 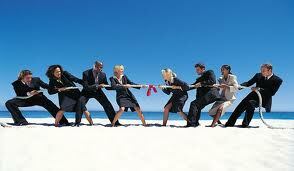 Although the anthropological view contracts this by believing cooperation and competition can coexist. Molina focused less on discrediting the theories on the evolution of cooperation and making a hard stance on which theories are correct or incorrect. Instead Molina structured the article to inform the reader of any relevant information and then introduces new anthropological ideas of competition and cooperation. Instead of discrediting the existing mechanisms of the evolution of cooperation Molina suggests viewing cooperation and competition differently may help to better understand them. By first stating the theories of evolution and then introducing the partially contrasting anthropological views of cooperation and competition help to build Molina’s argument that although these theories of cooperation evolution are helpful, for further analysis it would be best to adopt the anthropological view of competition and cooperation coexisting in social structures. While reading this article I was interested in in the contrast between the ‘moral economy’ Molina talked about in relation to the peasant social network and the ‘wolfish’ behavior mention by Hutcheon. Molina mentions members of a ‘moral economy’ regulating competition so that it doesn’t get to the point of annihilating their opponent, although some competition is still allowed. Moral economy in context of peasants is focused on collaborate to form mutually beneficial relationships to maintaining livelihood. This is a major contrast to Hutcheon reference to the ‘wolfish’ behavior preformed in academia and within the classroom. Both Hutcheon and Molina suggest that a certain degree of competition can lead to annihilating one’s opponents although Molina focuses on the balance competition and cooperation in order for the outcome to be mutually beneficial. While Hutcheon notes that this strong a focus on ‘winning’, competition as opposed to cooperation, leads to zero sum competition instead of a mutually beneficial relationship. In the reading response by Josiah Medin on Rhetoric and Competition by Linda Hutcheon, he suggests that for a society to function it cannot be completely void of competition. He states that society should function like a ladder with some rings positioned above others. I found this relates to the idea of prestige sphere and subsistence sphere mention by Molina when talking about tribes. There is competition (prestige sphere) in the rankings of the rings on the ladder, as well as egalitarian cooperation (subsistence sphere) between the rings that all share the same job in order to form a functioning ladder. Thanks for sharing! I was reading how you broke down the structure of the paper, and I think this is really valuable in regards to being able to persuade or inform an audience. As the author has been able to bring more value and credibility by the manner at which they discuss previous theories as they aim to not disprove, but just discuss and provide new perspectives. I appreciated how you contrasted this presentation method to the way that Bateson did so, where they are not “annihilating” their opponents. In looking at the papers from this light, do you think that the the author’s credibility increases as they introduce new theories, as is it true that more value comes when there is an increase amount of opinions- or is there a limit? Thanks for your post! I find it interesting that you compared Molina’s reading to Hutcheon. I tend to be more convinced with Molina’s anthropological approach on competition as she introduces many strong key examples from Tribal societies to agricultural such as the Potlach found in some First Nation tribes. As you said it does seem like Molina was arguing that both competition and collaboration co-exist and are sometime indivisible. In your last paragraph, it almost sounds like Both Molina and Hutcheon do have some common ground. Do you think that societies get more competitive and hierarchical as they get more developed, or have they simply always been intertwined between collaboration and competition;” the prestige sphere and subsistence sphere”? Thanks for the comment and great question! Coming from what I’ve learned in previous classes societies do tend to become more hierarchical as they develop. I think this is a result of the increased competition that stems from the co-operational start and formation of these societies. I think a great example of this the Molina et al uses is the potlatch. The basic idea of the potlatch is to cooperate and share with members of the society, but within that the prestige sphere of who cooperates and shares the most creates competition and hierarchy within the co-operational society. As societies develop, for example they adopt agriculture, there come more opportunities for competition within the society, such as who has control over the crops and how does food get distributed. By doing this the subsistence sphere gets smaller while the prestige sphere grows allowing for competition to increase and societies to become more hierarchical. Thanks for the great comment! I think the fact that authors are coming up with new theories without tearing others down is allowing scholars to build from each others’ ideas and learn new things. In doing this, although Molina et. al. are not agreeing with the mechanisms mentioned in this article, they are still giving credit to them. I think if this approach to writing is adopted by most of the discourse community more value will come from building of others research.